Geologists reconstruct geologic history by studying the Earth's surface with a number of different techniques. They rely on both air- and space-borne remote sensing instruments. They go out in the field and physically examine rocks, and they probe beneath the surface of the earth with drills and sound-wave reflection instruments. But those of us who are geologists studying distant planets and outer space must use different focused methods. We must combine what we know about geologic expressions on a planet's surface, such as canyons, volcanoes, and dunes and the mineralogy or chemistry of the rocks gathered by orbiting satellites with local-scale rock textures and cross-cutting relationships gathered by space craft that orbit or land on the planet. To further complicate our study, specifically as it relates to Mars, we must keep in mind that this planet differs significantly from Earth. For example, Mars has one-half the diameter of the Earth, one-third its gravitational pull, one-tenth its total mass, and just one-two hundredth the atmospheric pressure. Above left: Image on Mars of several, small-diameter pitted cones and domes. This image represents a scale of approximately 3.5 km wide. Image: Mars Orbiter Camera (MOC) Instrument team NASA/Malin Space Science Systems. See MSSS.com. 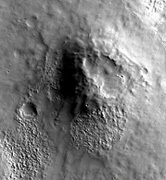 Above middle: Image on Mars, showing a positive-relief, crater-like feature. Image is approximately 15 km wide. Image: High Resolution Imaging Science Experiment (HiRISE) Instrument Team, NASA/University of Arizona. See HIRISE.lpl.arizona.edu). Above right: Image on Mars of two crater-like features with associated flows. 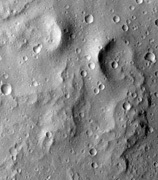 Area is covered by small impact craters. Image is approximately 15 km wide. Image: Thermal Emission Imaging System (THEMIS) Instrument Team, NASA/Arizona State University. See THEMIS.asu.edu. In addition, the average surface temperature on Earth is approximately 14ºC, while on Mars it is a frigid - 60ºC. All of these differences make us realize that what we know about Earth's geologic processes must be re-framed and scaled to Mars. Indeed, it's a daunting task! 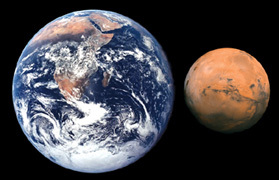 Above left: Earth and Mars, comparison of size and substance. Satellite image. 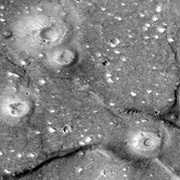 Above right: This image shows a region of Mars' surface that contains features of postulated mud volcano-like vents, flows, and surface deformations. The region is located along a globe-encircling scarp that separates the Martian highlands from the lowlands. 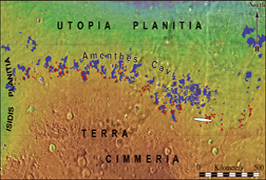 The putative mud volcano-related terrains lie between ancient, impact-scarred high plateaus of Terra Cimmeria (to the south) and low-lying, nearly-horizontal plains of Utopia and Isidis Planitia (to the north and west, respectively). While small magma volcanoes are common on Mars, they tend to cluster near large volcanic regions and their associated faults. However, the putative mud volcanoes, some of which are noted in this image, are widespread and are interpreted to be more closely associated with sedimentary basins, than with magma-related volcanic centers. A recent study of this region mapped out potential mud-related surface cracks, flows, and depressions (blue areas) and cone-and mound-shaped mud volcano-like vents (red dots). Because such regions can help geologists unravel the history of the Red Planet, including whether life once existed there, NASA considered this area as a landing site for its Mars Exploration Rovers. The white ellipse shows the location of the candidate landing zone. Our studies indicate that Mars is currently a cold, dry planet. However, evidence exists of vast channel systems and water-altered minerals, suggesting that it once contained surface and subsurface water. Mars generally lacks a large-scale, long-lived internal process for recycling rocks and sediment. Therefore, this may allow buried sediment to remain buried, yet under-compacted, for millions to billions of years. In addition, recent observations have revealed excess hydrogen in the Martian subsurface, especially at low elevations and high latitudes, which is an indication of abundant water and/or ice. All these factors together suggests that mud volcanism or a process very similar to mud volcanism may actually have occurred at some time on Mars. Above: These globes depict the western (top) and eastern (bottom) equatorial region of Mars, centered on Utopia Planitia, a low-lying circular plain that likely was formed by a very large impact early in Mars' evolution. Warm colors are high elevations while cool colors are low elevations. A globe-encircling scarp divides the Martian highlands and lowlands. In relationship to this investigation, we are especially keen to go to Azerbaijan and study the mud volcanoes there because what is known as classically-formed mud volcanoes is so easily accessible there. Another reason why Azerbaijan makes for an ideal study is that vegetation is sparse on the mud volcanoes there, and that makes them easier to study and compare by remote-sensing observations (there are no shrubs on Mars!). Another advantage is that mud volcanoes remain active in Azerbaijan. Since Mars has undergone little erosion, we think that by studying active mud volcanoes on Earth, we can get a fresh look at the depositional characteristics of mud-flows and can selectively avoid regions that may have been severely altered by non-mud volcanic surface processes, such as rain-fed channels. There's one other major advantage for studying mud volcanoes in Azerbaijan. Because that region has such a large quantity of mud volcanoes, many geologists have scientific and logistical background knowledge that is critical to the success of a field-based comparative analog study for Mars. We have been in contact with scientists at the Geologic Institute of Azerbaijan in Baku, and hope to be able to cooperate together on such projects. However, in a more practical sense, our studies can help shed light on Martian processes that are similar to terrestrial mud volcanism and provide a better understanding on ancient surface conditions that might have supported life. These scientific efforts may help select favorable landing sites for future exploration.